TEST RIDE: CycleBar – Royal Oak (Metro Detroit) – …it's all about Studio Cycling! This past weekend I was in the Detroit area for a special Dad/Daughters weekend. It was a quick trip away from my home in NE Grand Rapids, but we managed to squeeze lots in: lunch in Royal Oak, trip to the Holiday Market for dinner items to cook at home, a movie…Trainwreck!, checked out an interesting spot in Hamtramck called Fowling Warehouse, bocce at Ottava Via, a walk through Corktown (“Detroit’s oldest neighborhood”), strong drinks at Two James Spirits, lunch noodles at Johnny Noodle King, a stock up trip for the girls at Costco…and of course an indoor cycling class! This was my oldest daughter’s first indoor cycling class, but for me and my younger daughter a return visit. The first time was about 2 years ago, when the studio was GoCycle. Since then, it has joined the CycleBar franchise. According to CycleBar press, it’s the first and only franchise for studio cycling, and a more affordable alternative to SoulCycle and Flywheel…while continuing to offer a great workout in a boutique style studio. The Royal Oak studio doesn’t look anything like the pics in the press at the end of this post, but is a great neighborhood studio on Main Street Royal Oak. Other than the new CycleBar signage, the studio hasn’t changed at all since I was there the last time. The night before, we created our new CycleBar accounts and reserved our bikes. Drop-in classes are $18. The best deal is a multi-class advance purchase which can bring the cost per class down to $12! Rather than a free first class special, you can get a 3-class pass for $29 with your new account. 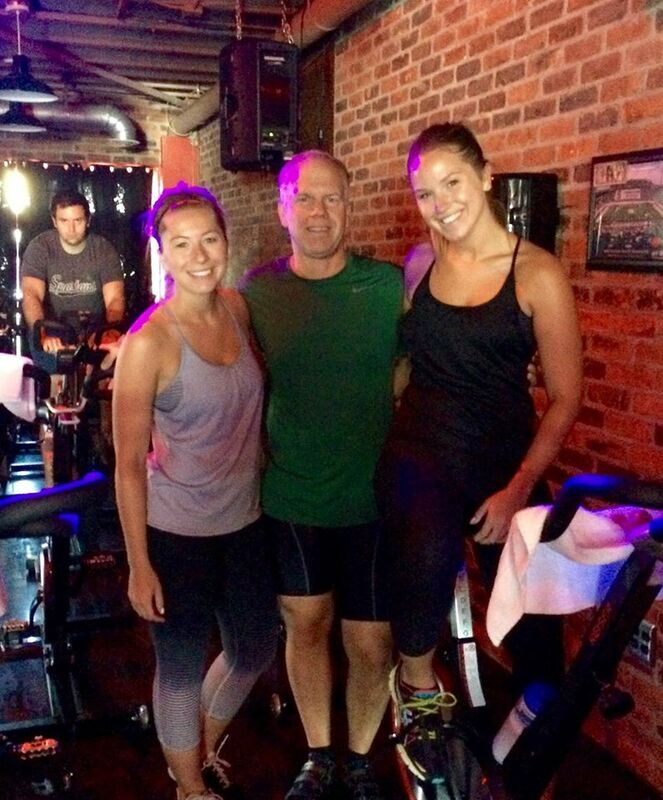 Our Sunday AM 10:00 class was a 45-minute BRUNCH RIDE. The post-ride Brunch was nothing special (so we opted for Bruegger’s Bagels instead). As for the class, after a slower start…things steadily improved along the way and the last 15-25 minutes were great! From start to finish, the class was based on video playlist…video displayed on the large screen HD monitor next to the instructor’s bike and the audio via the strong stereo sound system. Lydia was consistently cueing and keeping riders focused on the beat of the music. Lots of interval work on this ride. One track and the video has been stuck in my head for the past day and a half (see the Break Yourself links below). In addition to the standard Spinning-style ride, CycleBar offers classes with more upper-body strength work. This studio is worth a visit next time you’re in suburban Detroit.